One of my favorite stories about Georgia O’Keeffe is that she would often walk her property in New Mexico with a garden hoe cutting the heads off snakes that got in her way while looking for interesting things to paint. I can’t say if it’s a true story or not, but it sure seems fitting. Georgia O’Keeffe led a long and amazing life. Really. This woman was a true artist – ringing in photography as Alfred Stieglitz’s muse and then continuing on to be a celebrated artist all on her own. O’Keeffe’s artworks often depict flowers at their best – really close up. She morphed those pretty lilies into things that transported the viewer from looking at a plain-jane flower to looking at something really outstanding. And, it was different. AND, she really was a character. I only have the utmost respect for Georgia and all she created and accomplished. Well, the other morning at 6:20 am when the wee tot awoke and called, “mamammammamamama,” the sun had a nice warmth to it and there were a couple of flowers that had popped in the pre-spring happiness. It was time to head outdoors and go for a walk, just like Georgia did (hopefully without the snakes – I’ve had enough of those buggers). So, we went outside and picked a couple of morning glories that had opened on our deck. I figured they were perfect inspiration for our own O’Keeffe inspired flower artwork! I shared one of my favorite Georgia O’Keeffe paintings with the wee tot that looked just like our morning glories, Purple Petunias, 1925. My daughter oohed and awwed over the cool, cool colors. Often Georgia used sets of either cool or warm colors for her large-scale paintings. The cool colors are blue, green, and purple – colors that make you think of ice and crisp air. Warm colors are red, yellow, and orange, which bring to mind fire, heat, and excitement. 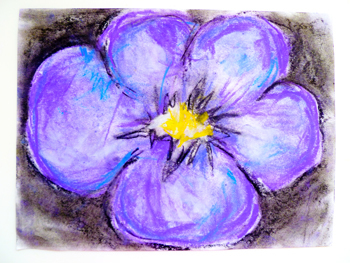 After I put the morning glories in a vase close by for us to look at while we worked, I got out the chalk pastels and a nice big piece of paper. Your child can pick a flower from the yard to use as inspiration, too (or you all can take a trip to your local flower shop to find a special flower for the art activity). Offer your child a black piece of chalk to outline the shape of the flower and then either use warm or cool colors to color the flower in. She can experiment with layering and blending the pastels on her paper. Encourage her to take her time and think about how to fill her paper with her flower. My wee tot is a bit young for the whole “taking your time” thing, so I drew an outline and let her go crazy with colors of pastels I handed to her. When your child is satisfied with her flower, offer a paper towel and let her blend, blend away! This gets a bit messy, so have some fresh, clean paper towels ready to clean up! Now she can go back in with pastels to add details and additional bursts of color to her O’Keeffe inspired flower! Once she’s finished, her flower creation can be displayed alongside the flower she used as inspiration so others can take a look at the real thing, and then her close-up rendition.